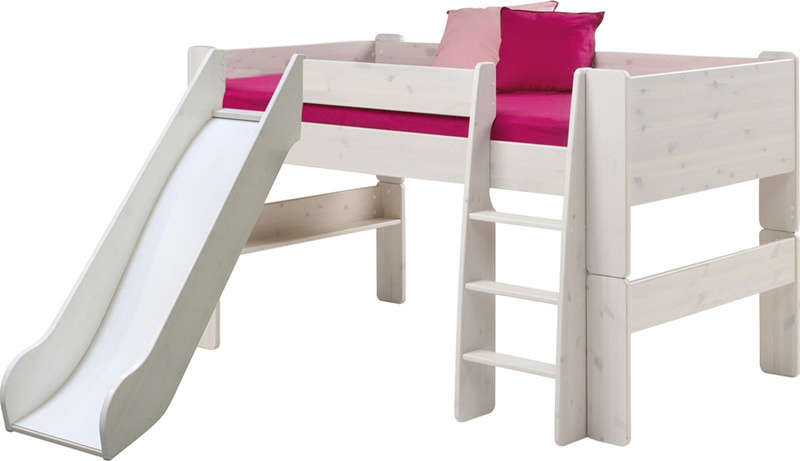 The Steens For Kids mid sleeper slide bed is made from solid Scandinavian pine with an easy clean whitewash finish. The fixed pine 3 step ladder offers access to the sleeping area and the wavy slide brings a little fun to getting back down. There is plenty of under bed storage space which is great for totes or matching furniture from the Steens for Kids range. The whitewash mid sleeper supports a continental 200cm long mattress for extended use, for safety the mattress should not exceed 16cm in height. As your child grows the Steens For Kids mid sleeper and slide components can be removed transforming the mid sleeper into a single bed.